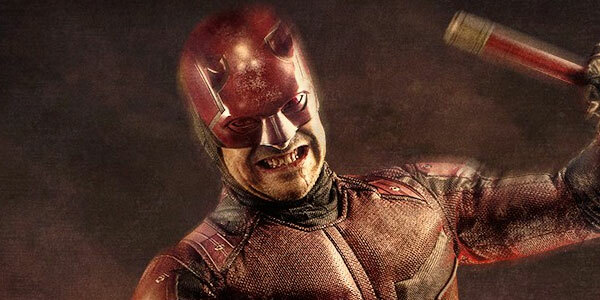 SPOILER WARNING: The following story features spoilers for the third episode of the second season of Daredevil. If you have not watched to this point, and don’t wish to be spoiled, please click away to another one of our wonderful articles! It was a probably two and a half, three day shoot, and it begins, I don’t know if you guys remember, but it begins with me carrying Jon Bernthal. I’m holding him, I’m carrying him over my shoulder for about a minute to a minute-and-a-half before the scene even starts, and I’ve got to tell you, that guys is heavy. He is pure muscle. So before I’d even thrown a punch or a kick, I was already sweating through my suit. I remember that much. In a conference call earlier this week, I asked Charlie Cox about what it was like to film the impressively choreographed and shot action scene, and his answer didn’t disappoint. The beginning of the “one-take” sequence features Daredevil carrying an unconscious Punisher on his shoulder from the roof down to a freight elevator, and while it was just the start of what would wind up being a rough couple of days on set, it was more than enough for Charlie Cox to start feeling totally exhausted. All in all, the sequence is about four minutes long, and once Daredevil places the unconscious Frank Castle in the elevator, the rest of the scene is dedicated towards the show’s titular hero taking down 20-some-odd bikers while descending a winding staircase. You’d think it would be the endless punching and kicking and jumping that would really stand out to Charlie Cox when thinking about filming the battle – but I guess carrying Jon Bernthal while filming in the summer heat was just much of a challenge. Surely many of you plan to rewatch the “one-take” sequence featured in Daredevil Season 2 multiple times (it’s worth it), but now you can do so with the knowledge of just how hard it was to create. It may even wind up making you appreciate it even more. Daredevil Season 2 is now streaming on Netflix.